Propagation whether from seed or cutting is the starting point of growing anything so I’ve invested in a bit of kit to assist me in getting the propagation environment just right. 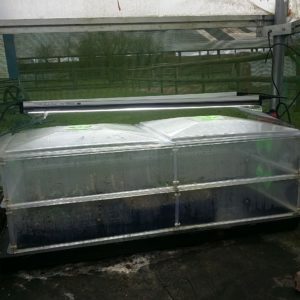 I’ve been using a Vitopod propagator from Greenhouse Sensation for a few years with a lot of success. It’s heated with an easy to control thermostat so I can tailor the warmth to the seeds I’m trying to germinate. Not getting too hot is just as important as not being too cold when it comes to germinating seeds. Some seeds just won’t germinate if it’s too warm. Once seeds have germinated they need light to grow well. Too little light can lead weak to etiolated seedlings. 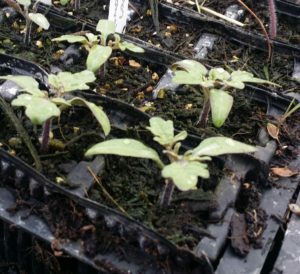 While the polytunnel obviously gets a lot of light and I’ve never had a problem with etiolated seedlings the days are shorter at the end of winter and beginning of Spring. Shorter day length can affect the flowering of plants, this is known as Photoperiodism. 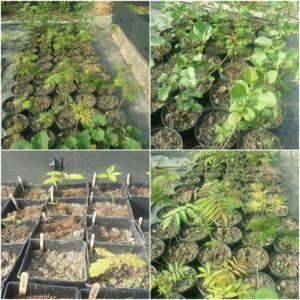 I don’t plan on specifically growing plants that demonstrate photoperiodism currently but I do want to make sure that my seedlings benefit from having the maximum light they can. 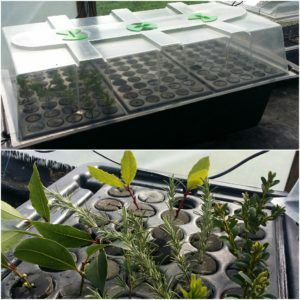 Using artificial light also means I can start my seedlings inside if I want to, that I can extend my growing year by starting seeds off earlier and I can grow plants that are used to longer growing periods. 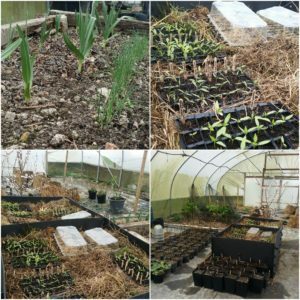 With all those benefits in mind I had been thinking about how to use some horticultural light in the propagation area of the polytunnel. Fortunately, Greenhouse sensation have just brought out a light kit for the Vitopod propagator so I treated myself this week. It’s very easy to put together and fixes onto the propagator with suction pads. I’ve plugged it into a timer and set that so the lights come on from 3am to 6am increasing the day length. Here’s a picture of the lights on the propagator. The support for the lights is made out of clear plastic so it does look like the lights are just floating above the propagator. You can adjust the height of the lights very easily. 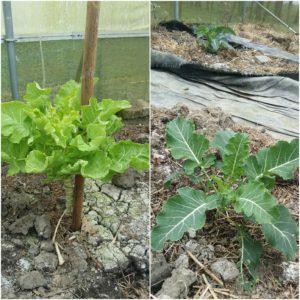 We’ve also got fruit trees in the polytunnel. 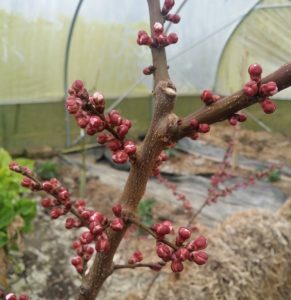 Once again the Apricot seems to be aiming to be the first to blossom. 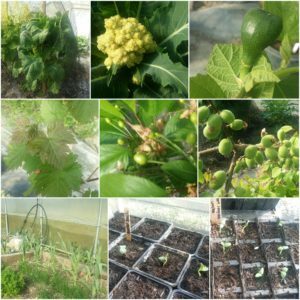 Hopefully we’ll have another good harvest this year. 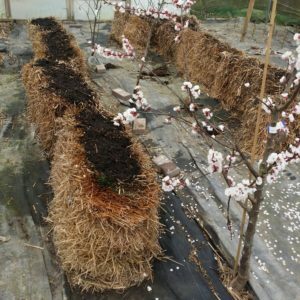 Last year we tried growing in straw bales for the first time. 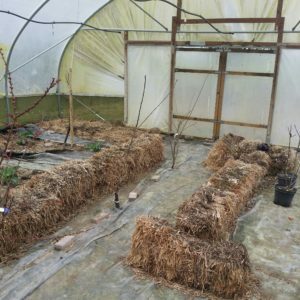 It was very successful and the bales have survived the winter. They aren’t quite as sturdy as they were though so I think this year I’ll mainly use them for salad crops. I’m going to leave them in their current position because I suspect they might disintegrate a bit if I start hauling them around the polytunnel. This is how they look right now. As you can see the polytunnel could do with a bit of a clean. After the big storm recently we’ve decided to replace the cover so there’s little point cleaning it now. We’ve got the replacement cover ready to put on we just need to wait for a dry, non windy day.